Salvation And Survival: But Where's The Application? I love to read inspiring articles and opinions/commentaries. And my heart is always over-joyed when the words I read echo the sound of the Lord's voice that I hear. There are even times that I feel like I could have written what I'm reading -- that's how close the narrative is to how I would explain a particular Biblical truth or concept. But it saddens me when the narrative falls short of telling us how to apply that truth. Of course that is not true when reading the Bible. The Word is very clear how to administer God's principles. For instance, He holds us accountable and responsible for every word, thought, action, attitude, and motive. He makes it clear how He expects us to respond .... When we offend others, we are to ask forgiveness and make proper restitution [if needed], as declared in Exodus and Leviticus. The application of this principle/concept is evident in the story of Zacchaeus, the chief tax collector, in Luke 19:8-10. Furthermore, the result of the application is confession and salvation, as stated in Romans 10:10. God tells us what He wants us to do, and then He tells us how to do it. However, it is not only articles that have left me searching for how to walk out this Christian life. Oftentimes, I have heard brilliant sermons establishing God's heart on a particular subject matter -- for example, taking every thought captive. I have heard how to recognize when we need to take a thought captive; why it is important to do so; the consequences of failing to do it; and even where that captive thought comes from. But I have rarely been given the practical application of how to do it. So when I see an article's headline that shouts The Only Way To Stop The Devil From Stealing, Killing, and Destroying In Your Life, I'm thinking, "This is going to be great! Not only does this article seem to be saying they have the Best method, but the Only method". And, I have to tell you that I was really impressed with some of the ideas expressed ... namely, we don't have to let our feelings or circumstances control us when we are facing overwhelming situations. In those moments, God wants us to stand still and see His salvation/deliverance/healing. And I was in total agreement with the following paragraph: "If we are broken at the beginning of our journey, and we are not keeping our eyes on God, the enemy's job is to take what is broken and scatter the broken pieces even further apart. 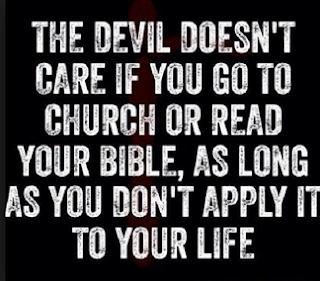 The devil's job is to kill, steal and destroy (John 10:10). Father wants us healed and whole. God is not expecting us to be perfect soldiers. He is looking for the soldiers that will say yes and obey His will. We are to believe and trust in becoming whole from brokenness as we remain in Him during our journey". I have never heard such a concise implication of Luke 4:18-19 and Isaiah 61:1. Furthermore, these are the very experiences that I have witnessed in the Deliverance Ministry that my husband and I have been called to by God. I was thrilled to read the writer's words: whether health issues, financial struggles, family issues, or brokenness that results in emotional and mental problems, abandonment, rejection or loneliness, it is always the desire of God's heart to heal us. "You were created to overcome. You were created to have dominion. You were created for purpose, on purpose". Amen! I'm in total agreement! But then I realize that I'm at the end of the article. I understand the concept. I understand that "Once we line up with [God's divinely willed purpose for our lives], there will be no more broken pieces". Again, I agree! I get that we need to come into agreement with God's plan for our lives, and we can expect to be made whole. But HOW do we do that??? It's not enough to get the concept! If we aren't told [or discern on our own] how to apply that truth of the concept to our lives, then does anything really change? If I'm unable to put that truth into action, then how do my circumstances change? How do I overcome? Have dominion? There is so much well-written encouragement and exhortation in our Christian media and from our pulpits. And I know how difficult it can be to express what your spirit and heart want to convey -- I know I have been guilty of falling short of my desired goal many times. So, I am holding myself to the same high standard that I am calling the Christian community to... it's not enough for me to call your attention to an important principle of Christian life without also presenting how God's Word expects us to accomplish it. I am doing you a disservice if I'm unable to point you to His instruction in His Word; to encourage you to meditate upon it; and to determine your own belief system (based on Scripture) and be able to support it. Sadly, I discern that too many in the Body of Christ are willing to accept a teaching without ever questioning it or applying it. So you have Believers that are blown about by every changing wind of doctrine, or who settle for a diminished definition of the Great Commission because they have never been taught the full application of God's Word, or seen it modeled. It's not enough to recite a lot of Scripture, if you don't know how to apply it. Knowledge is not revelation; and revelation without application does not bear fruit. It is my hope that the Christian community becomes more attuned to equipping the Body of Christ to make true disciples of our Lord; people who know God's commandments and are able to guide others into the application of His will. Philippians 4:9 The things which you have learned and received and heard and seen in me, practice these things [in daily life], and the God [who is the Source] of peace and well-being will be with you.